But all that skill and know how remained in the workers, without any way of showing the world what they could do. That is when David started Hiut Denim with his wife Claire as part of an effort to bring British Denim manufacturing back home, utilising the skills that were on his doorstep. And to breathe new life into the town. The results have been a reinvigorated workforce working with some of the best materials, (customers can choose from 12oz Turkish organic, or 14oz selvedge from Japan’s esteemed Kuroki Denim mill) producing some of the finest jeans in Britain. David is also the Co-Founder of the Do Lectures (dolectures.com) an annual (now biannual) event in the nearby countryside (and now California too) featuring talks, music and workshops with leading thinkers and doers: like a more friendly, down to earth version of TED, but in rural Wales. Among his other business’s is The 25 Mile, a gastropub in Cardigan, which only serves food sourced from within 25 miles of the town itself. The Holborn got in touch with David to ask him about Hiut, and David wrote back to us with this excellent article for anyone who is a maker, is interested in making or just looking to read about a great business. Makers are here to make. Makers are here to sell – Van Gogh had to wait till he died before he sold his first painting. You can’t. IV) No one goes to bed at night and dreams of quality. We make one of the best pair of jeans on the planet. And we are very proud of that. But that doesn’t mean that is the best way of selling it. Quality is what we make. It’s what we stand for. It’s what we believe in. But it is not how we will sell our jeans. People have desires and dreams and you have to learn how to make your product fit into them. People buy a lifestyle, an image, a purpose, a superiority, part of a small elite club, rejection of the norm. Part of your job will be to understand their desires, and make sure what you make appeals to them. Your customers go to bed each night and dream their dreams. They dream about changing the world, they dream about starting an amazing company, they dream about all sorts of crazy stuff. But they rarely dream about quality. Don’t ever compromise on quality. But sell the dream. V) It’s a small club. But a good club. The makers club is a small club. But, everyone in it wants the club to grow. That’s why there is a culture of trying to help each other. If you need a certain machine, or a particular service, someone in the club will know the answer. So don’t fret, you are not alone. One example. Chris from Noble Denim asked us if he could come over and learn from us as he wanted to start a denim company. Conventional companies would have said no. Help a rival? Pah. Are you mad? But if you are in the makers club, you want more people to join the club, so you say yes. Noble denim (nobledenim.com) is up and running. And we helped in a tiny small way. But we helped. Right now, we are the only British denim brand making its own jeans in its own factory in Britain. But we had help at the start from Jayesh and his family up in Leicester. They helped us make our prototypes before our factory was going. And I told them I wouldn’t be able to give them any business in return. Why would they help us? It took 3 set of samples before we were happy. And they did each one with a smile. They wouldn’t even take any money from us for doing them. The makers club is like that, you know. We will try and repay that favour one day. The makers club doesn’t exist in reality. It has no address, it has no business card, it has no website. But even so it is real. And it will help you. As soon as you start making, the makers club will be in touch. VI) The more you work in the future, the less competition you will have. This is a quote from a talk by Richard Seymour. And I think he is right. Our job as makers is to take the skills of the past and apply them to the future.We want to protect our skills from dying out. And the best way to do that is to give them a lead role in the future. One great example is the DodoCase. They used traditional book making skills that were dying out in San Francisco and they gave them a new life by applying those skills to making iPad cases. The result is a beautiful and super useful product that is in huge demand. Finding a way to marry the luddite skills with geek useage is something more and more companies will have to do if they want to fly. For us at Hiut Denim, we figured there are more than enough jeans companies out there. The world doesn’t need another one. The question for us was how could we bring some new thinking to it. One insight came to us while staring at an old pair of Levis from 1876. I looked at them and I wondered what stories they could tell us. What was their best day? Did they strike gold? Did they fall in love? How hard were the conditions? But the jeans couldn’t tell me anything. They were born before the internet. 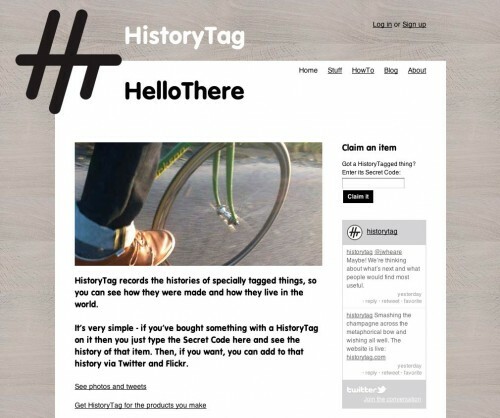 So every pair of our jeans comes with a HistoryTag. A unique number that allows you to sign up to the HistoryTag website and then allows you to update where you went in them and what you got up to in them. Then, if one day, those jeans end up in a second hand shop, their memories will go with them. We are first jeans maker in the world to do this. We are operating in the future. And that gives us a fighting chance. VII) It is going to take time. And it’s going to take some old fashioned hard work. Those who want short cuts, who want to be overnight success are going to be in for a bit of disappointment. There is no substitute for the hard work you will have to put in. Doing the work is rights of passage. A business has to find its feet. Knowledge has to be learned. Skills have to refined. Reputations have to be earned. Customers have to be found and retained. A business will tell you when it wants to grow, and when it does, let go of the reigns. But not too much. One of the most important aspects to building a business is patience. It is a rare commodity. VIII) Know who you make for. We make jeans for creative people of the world. The ideas that they have and the change they make inspires us. That’s who we make jeans for. What could be a better honour than making jeans for people who are pushing this world forward. I think its important to know exactly who they are. And focus on them. Be narrow. It’s much better to mean a great deal to a few people. Than next to nothing to a huge amount. IX) Do some silly stuff. Now and again. I think a sense of humour is important. It sure helps you get through the day. And makes a long journey so much shorter. It will also help you stand out from pretty much everyone else. X) Don’t rely on just being the best. I was doing a presentation to a famous department store recently. I told them all about our town, and how it used to make jeans. They got it. They took a look at the jeans, and they turned around to me and said ‘these are the best made jeans they had seen in years’. Given they sold pretty much every denim brand you can think of, it was a nice compliment. But, a few months after that meeting, they still hadn’t bought any jeans from us. But I wasn’t surprised. Our rivals may make an inferior quality jean compared to ours in terms of quality and craftsmanship, but they have other things going for them: They are more well-known than us, they have more history than us, they have a bigger marketing budget than us. So for us, just being the best is not going to be enough for us to win. Yes, we have over One hundred and fifty years of experience of making jeans within our company, and we make one of the highest quality handmade jeans on the planet. And yes, our natural indigo dyed selvedge is made by Kuroki who hand dip it ten times until the dye gets to the very core of the cotton, so they age as beautifully as a jean possibly can, but it’s not enough to win. For us to win, we have to come up with ideas that challenge the Status Quo of an industry that had its most innovative day back in 1886. Our ideas will be how we build our company. Our ideas will be how we get people their jobs back.